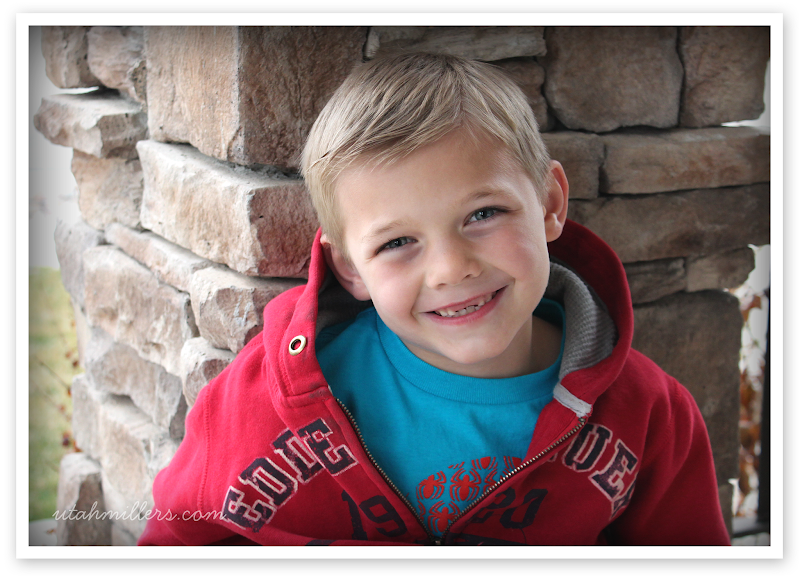 This awesome kid just turned seven! Man, we sure love this boy and can't imagine our lives without him. I tell him every morning when he wakes up that my day just got happier because he woke up and I truly mean that. He brings so much happiness to our lives and we feel so blessed to have him in our family. I'll start this post by giving you a little update on his life and then I'll tell you about his birthday. We call Bryson "Volcano Boy" because he is always hot--or so he claims. The second he walks in the door from school, he strips down to his undies (he sometimes adds his robe) and that's pretty much how he stays the rest of the day. I do make him put clothes on if he wants to play outside, if we have company, or if we go anywhere, but whenever he's home, he's usually in just his undies. 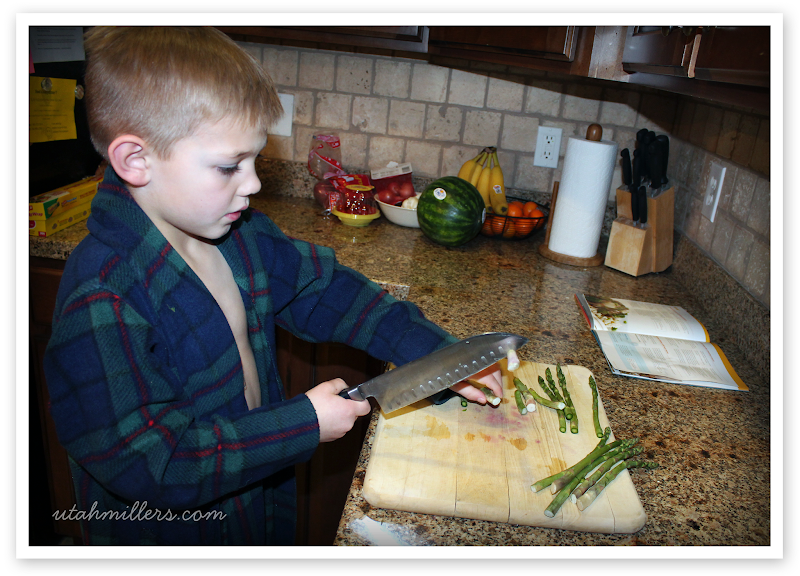 He sleeps in his undies, does his chores in his undies, cooks in his undies, eats in his undies, etc. We buy Bryson his needs (clothes, food, etc), but if there is anything Bryson "wants" he has to earn the money to buy it himself. 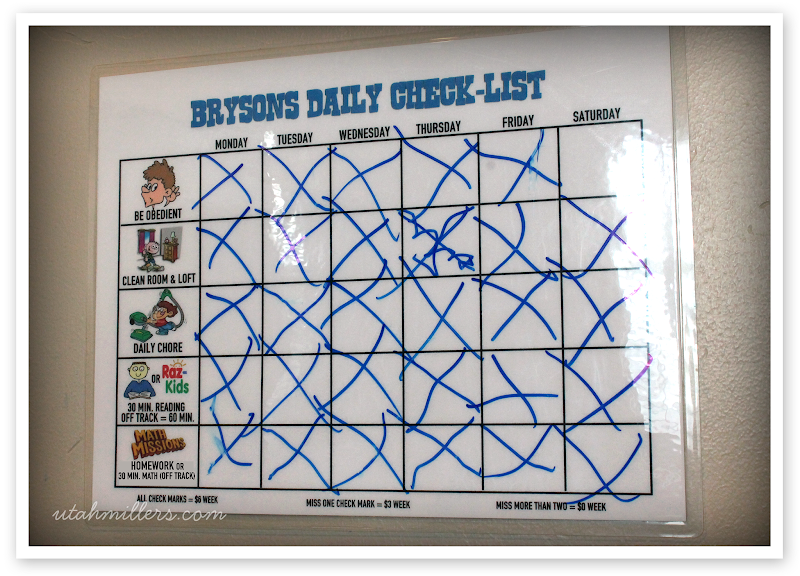 So he works like a mad man each week to earn all of his X's on his chart (see Our Money System) so he can earn his weekly allowance (now $7 since he just turned 7). He is such a go-getter and refuses to play with his friends until he gets all of his X's for the day even though they usually keep knocking and begging for him to come out an play. Sometimes we even have to beg him to go out and play, but he insists on getting all of his X's for the day first. He is one determined little boy. Bryson LOVES Lego's. Lately he's been spending the money he earns on new Lego sets. 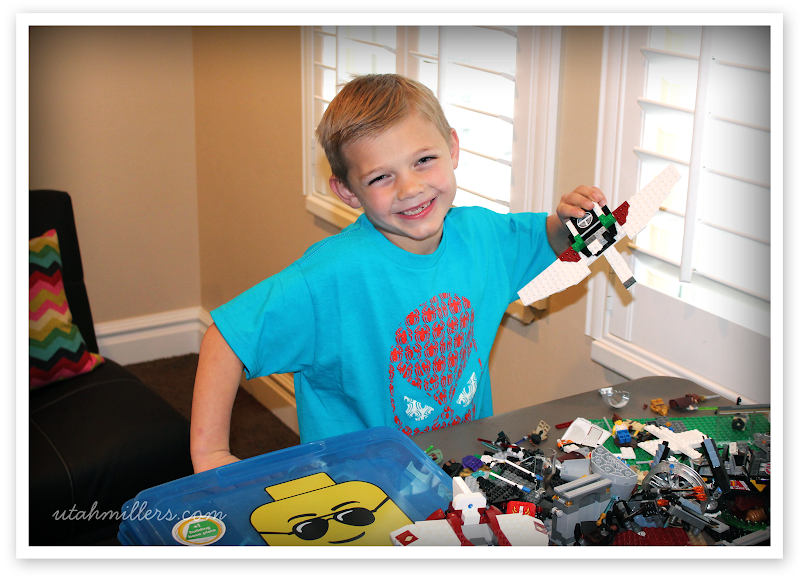 He's especially a fan of Star Wars Lego sets and Ninjago Lego sets. Here's a clip of a fun little experiment we did with Bryson last night. We topped four pieces of celery with four different toppings (almond butter, hummus, Nutella & peanut butter) and had him close his eyes and guess which was which. I'm mad I missed his reaction to the hummus because it was classic! 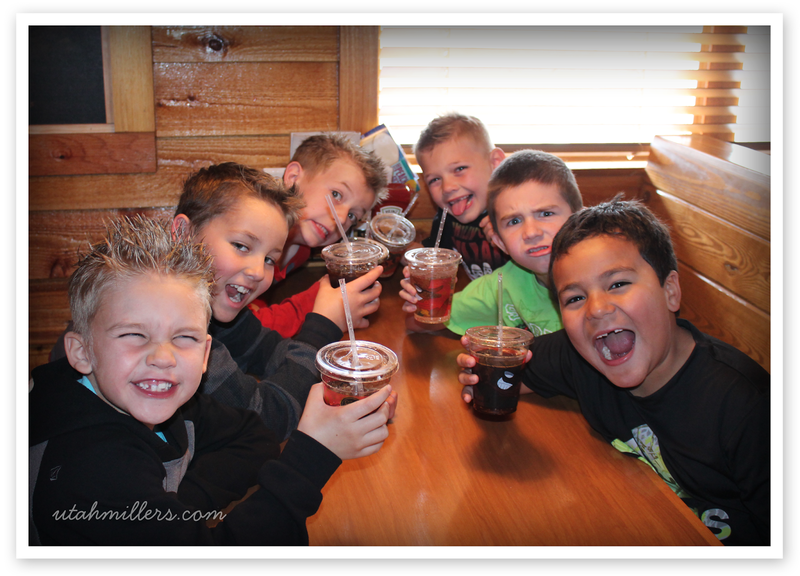 Bryson took a fun field trip the other day to the Texas Roadhouse. They took a tour of the kitchen, got to make their own rolls, they learned a line dance and got to eat a free meal complete with a free drink. 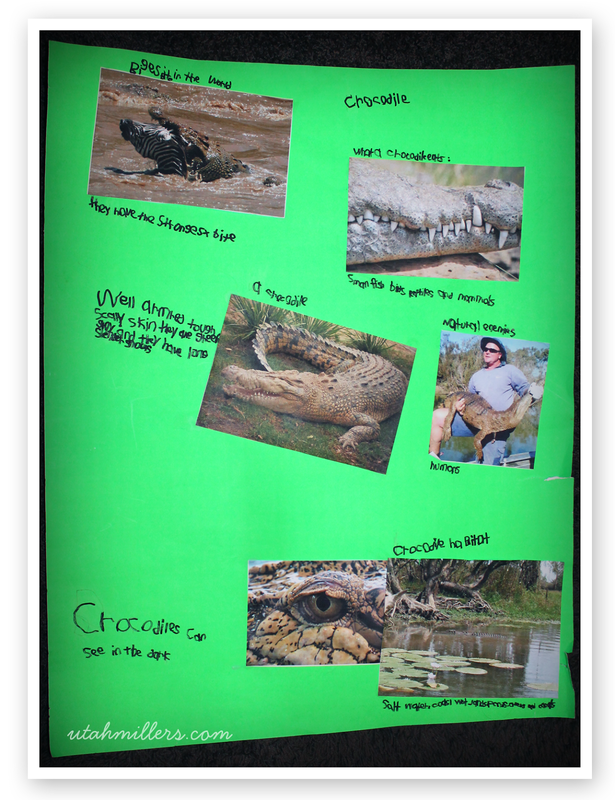 Bryson got to do a report on an animal of his choice and chose to do it on crocodiles. He really enjoyed learning about crocodiles and can now tell you anything you want to know about them. Here's the poster he made for his class presentation. And here's a very random clip of Bryson demonstrating how to run like a monkey. Now onto Bryson's big day. 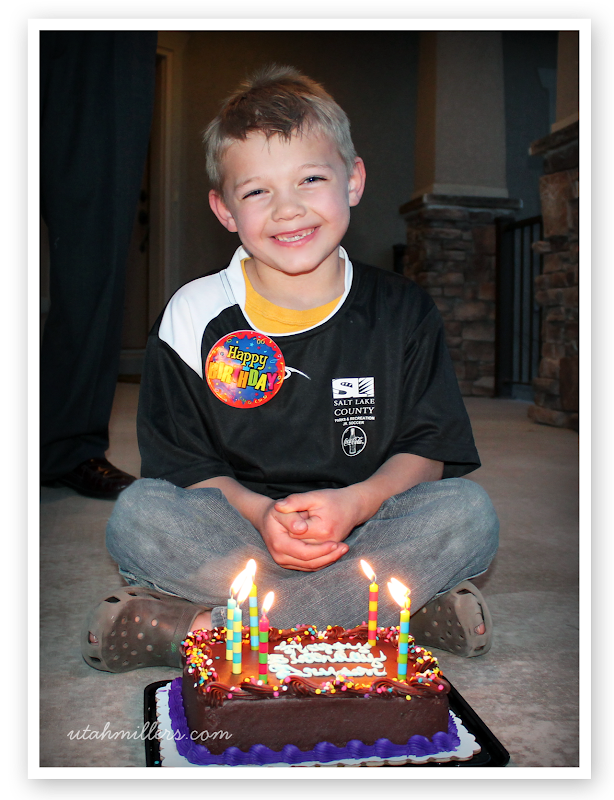 Bryson celebrated his 7th birthday on March 24th. Since we went to Disneyland for his birthday, he didn't get a party this year. He was a little bummed about that because he knew it meant he wouldn't get very many presents but he understood and was a good sport about it. Grandpa & Granny stopped by and were waiting on the porch for him with a present when he got home from school. 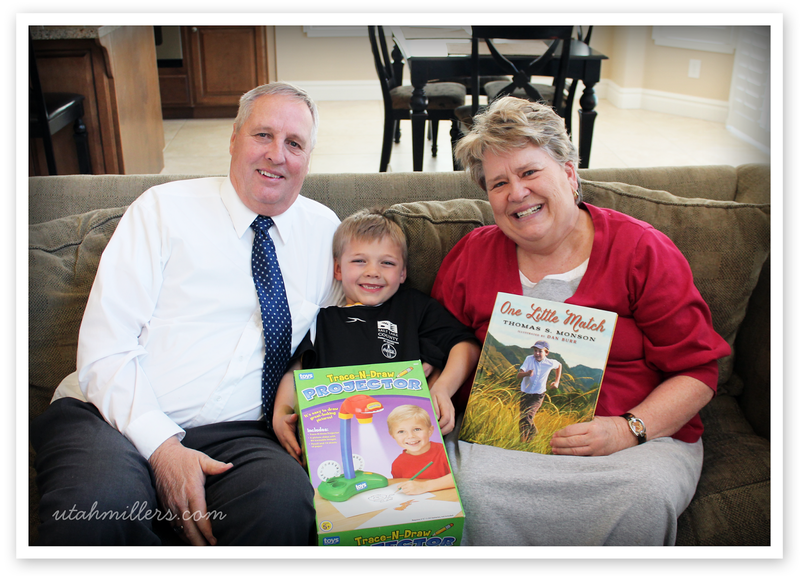 They gave him this very cool projector and a book about President Monson. 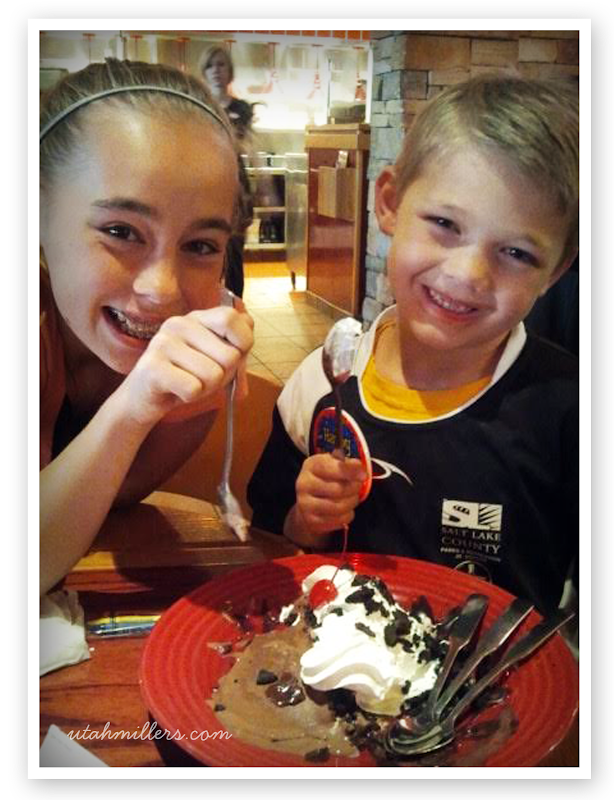 Then they took him to his cousin Zyan's soccer game and then we met up with them at Red Robin (Bryson's choice) for dinner. He loved the free birthday dessert they gave him. 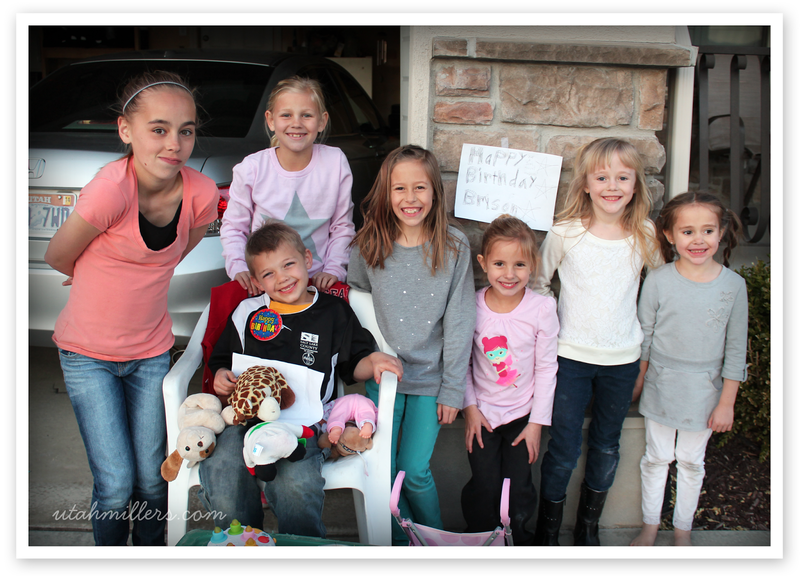 When we got home, all of the little neighbor girls from our cul-de-sac had the cutest little birthday party all prepared and waiting for him complete with a birthday sign, toy cake and pretend presents! 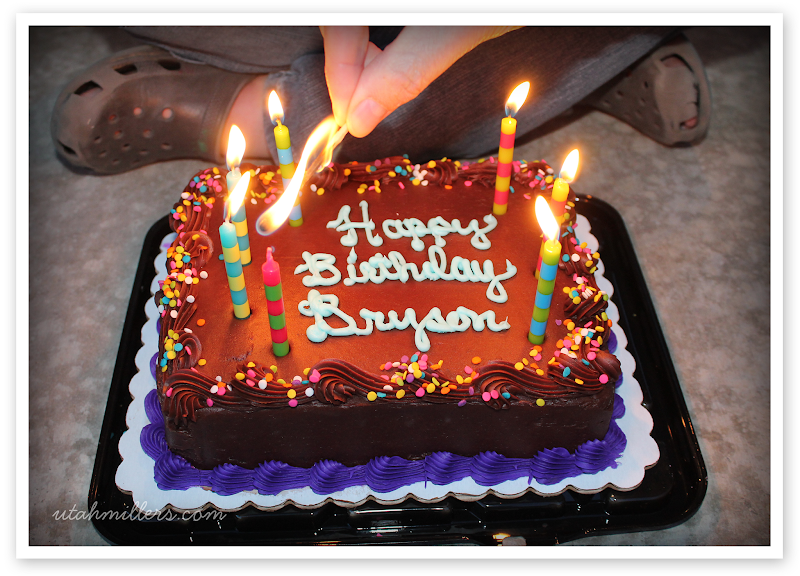 They worked on it for hours and just couldn't wait to surprise Bryson with it when he got home. Bryson was just beaming from ear to ear and was so excited that he ended up with a birthday party after all! It was seriously so sweet and thoughtful of them and completely made Bryson's day. 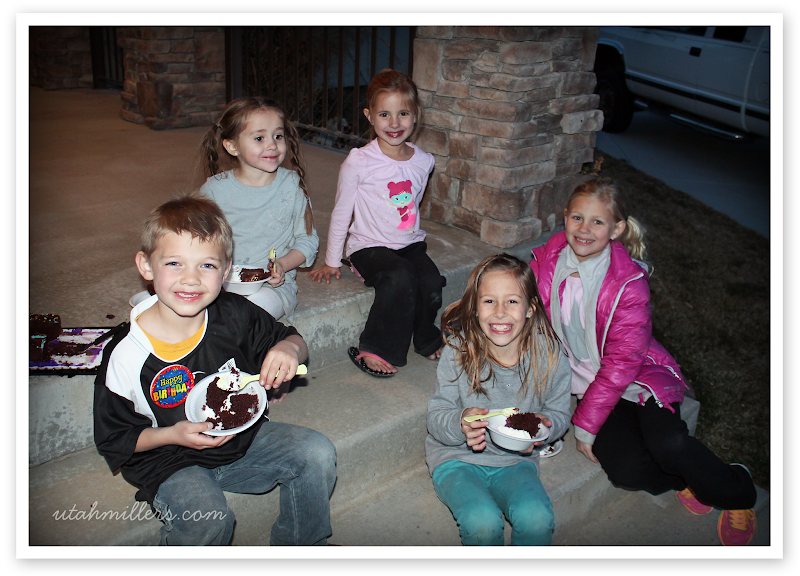 We bought Bryson a little cake and decided to take it outside to share it with the girls for being so sweet and planning such a cute party for him. 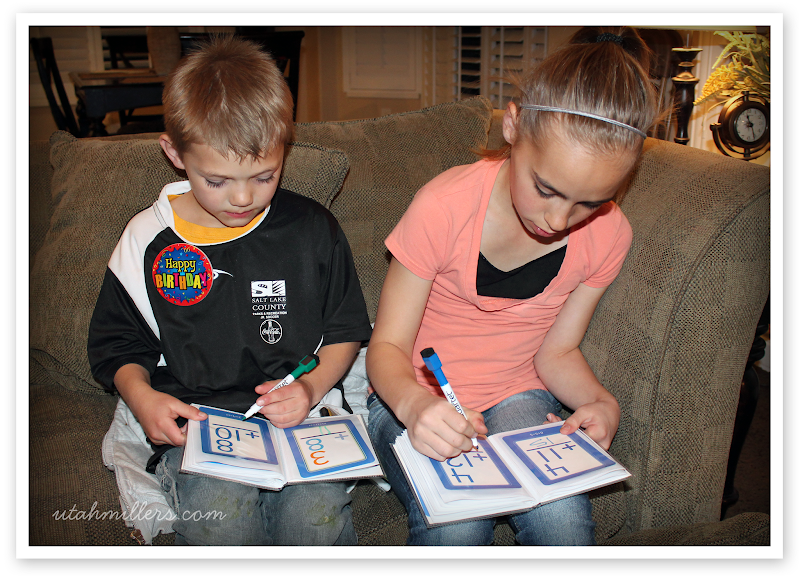 Then we went inside and opened the couple of presents we got for him--he got a small Lego set, some new clothes and these homemade math books with dry erase markers. And here's our traditional video of Bryson telling about his life right now. "The best way to defeat your enemy is by making him your friend."